I know, you have loved the Hash Brown Casserole found at Cracker Barrel. They have now raised the bar, check out the new Cracker Barrel Loaded Hashbrown casserole. The Cracker Barrel Loaded Hashbrown Casserole was a dish that was recently served as part of their seasonal menu. They often switch out menu items on a seasonal basis, and I fell in love with this new heartier casserole. It featured sausage, four different types of cheeses, and red bell peppers. This casserole is hearty enough to be served for dinner. 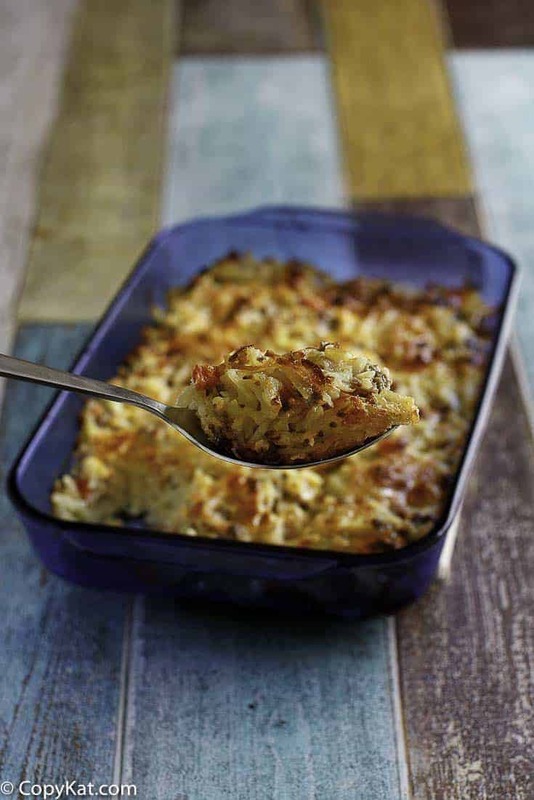 While I love both versions of this casserole, this one is more sophisticated. 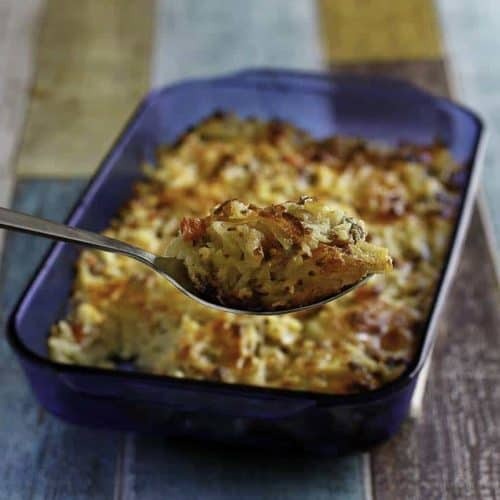 What makes this hash brown casserole different? Four types of cheese would be one. This one has American cheese, Colby cheese, Monterey Jack cheese, and Cheddar. All of these cheeses together combine to make a wonderfully rich cheese sauce that is smooth and creamy. You won’t be disappointed in here. I also like the addition of the red bell peppers and sausage. The sausage adds a nice touch to this casserole. I like to use sage style breakfast sausage, a bit must be those Midwest roots in me showing. You could make this with a spicy sausage as well. If you wanted to make this casserole your own, I would suggest adding some onions into the sausage while you are browning it, or perhaps even a jalapeno pepper. Both of these additions would make this casserole very tasty. I did find this casserole reheated fairly well, so if you don’t finish it all at once, it will reheat just fine. 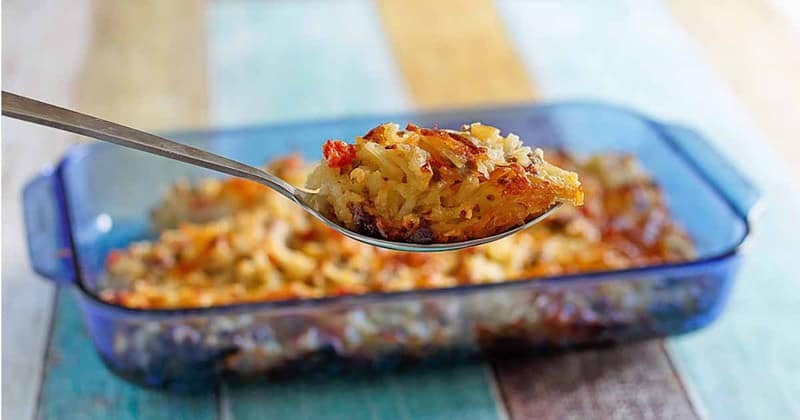 Cracker Barrel Loaded Hashbrown casserole is their famous casserole with sausage and more. Brown sausage in a large skillet over medium heat, be sure to break the sausage into small bite-sized pieces when browning. When sausage is almost done add 2 to 3 tablespoons of chopped red bell pepper into the sausage. Drain sausage when finished cooking. Add 2 tablespoons of butter in a medium-sized saucepan. Add 2 tablespoons of flour to the butter. Allow the butter and flour to cook over medium heat for about 1 minute. You must cook the flour and butter mixture together so that the flour won't taste raw. Add 1/4 of the milk to the roux, and stir until thickened. Once the sauce is thick add another 1/4 of the milk, and stir until thickened. Finally add the remaining milk to the sauce once it has thickened. Once the sauce has gotten thick add the cheese and stir until the cheese has melted. In a large bowl combine hash browns, cheese sauce, and sausage. Stir to combine. Pour mixture into a 13 x 9-inch baking dish. Top with additional grated Colby cheese. Pure comfort and joy with this recipe! Such an epic hash brown casserole. Love all the ingredients in here! I am sure this will be a hit in my house!! These are sooooo good- thanks for the secret recipe! The more cheese the better! What an amazing potato casserole!! I grew up eating a similar dish so I know how dreamy this tastes. Though it has been forever since i made it at home. Pinning it to put it on our weekend menu. If you use cooked potatoes and then grate add cheese sauce with sharp cheddar and a a couple of hardy spoons of sour cream. Salt pepper and bake. I always sprinkle cheese on top. This dish goes quick. Serve with any meat. Doesn’t have sausage or peppers but you could try adding spinach broccoli ham or whatever you want. This sounds like something I could make ahead and take camping with us. We can heat it up in the little microwave in the camper. I’ve been looking for easy recipes that will travel like this. I feel stupid but here goes…Is American cheese a product like Velveeta? It is kind of like it, but I think American cheese always needs to be refrigerated. frozen hash browns ok, or does it need to be fresh? I use frozen hash browns. If you wanted to use fresh, I would make sure the potatoes have been par boiled slightly. you really dont have to , I find that fresh shreaded potatoes cook very rapidly. is it 1 pound or 2 for hash browns? It is 1 package that is 2 pounds. Hope that helps!